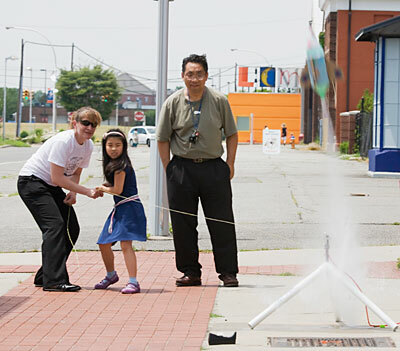 Garden City, N.Y. – On Saturday, June 25th, children from across Long Island participated in the 7th Annual Water Bottle Rocket Competition at the Cradle of Aviation Museum. The competition was open to all 3rd through 8th graders. Children built, designed and launched their own water rockets! Participants were taken into the Museum’s Space gallery where they were given a brief lesson in rocketery. Immediately following, the children began their Rocket Building workshop. With the assistance of the Education Department Staff, the children added fins, ribbons, parachutes and unique designs to their rockets before setting off to the launch pad. Outside, bottle rockets were half filled with water, flipped upside down, and placed on a rocket launcher. Participants eagerly watched as pressure built within their bottle rocket before counting down and watching them skyrocket into the air!